History of the Victoria West Lawn Bowling Club dates back to February 20, 1929 when at the urging of the Victoria West Brotherhood, the Parks Committee of City Council recommended that a sum of $1600 be placed in the estimates for the construction of a bowling green in Victoria West Park. In 1930, a clubhouse was built with volunteer labour and useable lumber from the demolition of some old city- owned garages. Two of the City’s conditions were that an annual fee of $1 be paid to the City and that the clubhouse be made available as a change room for the soccer players using the park. In addition to being instrumental in the establishment of the Lawn Bowling Club, Mr. Stanley of the Victoria West Brotherhood was instrumental in the establishment of the longest standing inter club tournament hosted by Victoria West. The Brotherhood comprised a group of people concerned for the welfare of Victoria West and active in encouraging community activities. Mr. Stanley, a Victoria merchant, while not a bowler was a supporter and in 1933 presented a trophy to be awarded annually to the winners in a Ladies pairs competition. Thus lawn bowling had its Stanley Cup! 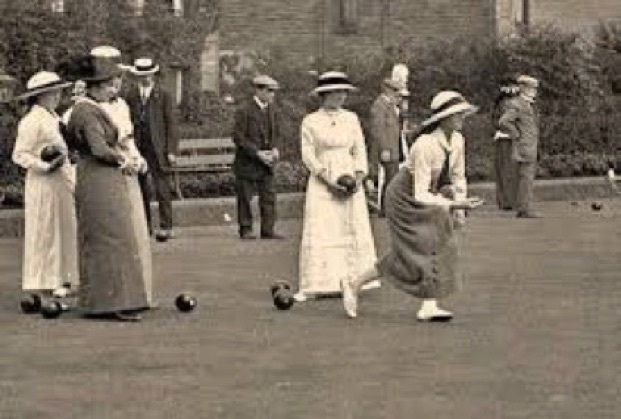 In 1934 the Club voted to make the Stanley Cup an inter club tournament and it became a popular Ladies Scotch Pairs Tournament among the Greater Victoria Lawn Bowling Clubs. In 1964 the Stanley Cup was replaced by the Baker Cup in honour of Gladys Baker who was a charter member of Victoria West, President in 1942 and a long time active member. The Baker Cup continues to be a prized Scotch pairs tournament among competitive women bowlers from the South Island region. In 2012 this tournament was renamed The Lynn McElroy Memorial after one of club's Canadian Champions. Mr. N. S. Fraser was the first president of the Victoria West Lawn Bowling Club and many familiar names emerge from the minutes. Bryant, Warder, Wallace, Hiquebran and Findlay are just a few of the 40 people who contributed time and money to establish the club. The second tournament that Victoria West hosts under the auspices of Bowls South Island is named for the Findlays. The Findlay Memorial Mixed Triples was established in1965 and is held annually in July. Archie and Nellie Findlay were long time members of the club who, while they declined to hold office, worked tirelessly doing the many tasks on the green and in the clubhouse that make a club successful. Today the membership nears 100 and for several years included six to twelve visually impaired bowlers assisted by volunteers from the club.In 1978 a new clubhouse was built with aid from a government grant. The green is bordered with a beautiful display of flowers maintained by the many volunteers who work hard in and out of the clubhouse taking pride in the fact that Victoria West is known as “the friendly club”. In 1985, Victoria West introduced a new tournament for which it has become known all over Vancouver Island, an open triples competition called The Bert Nelson Bowlspiel. Bert Nelson joined the club in 1983 and together with his wife, Linda became very active in all aspects of the club. Bert was also an avid curler and in 1985 devised the bowlspiel in the format of a curling bonspiel. It is held annually on the weekend before the Labour Day weekend. Cash prizes are generous and the event is so popular there is always a waiting list to participate. Victoria West enjoys hosting teams from all parts of Vancouver Island for this event. Bowlspiel is the final big event for the year but while the green rests silently through the winter months, the clubhouse remains active with Wednesday and Friday afternoon games of rumolli, bridge, short mat, mah jongg, yoga, scrabble and monthly pot luck dinners.